An alleged perpetrator stole more than 100 rare pieces from the world's largest Star Wars private collection. Rancho Obi-Wan is a non-profit organization that donates money from tours to charity and it's run by Stephen J. Sansweet. Sansweet sent out an open letter to fans to keep an eye out for any of the missing items on the Internet. Vintage Star Wars values continue to rise and collectors from all over the world are on the hunt to fill in gaps of what's missing in their collections. Unfortunately, Sansweet has a huge gap of over 100 items that have systematically been stolen from him. Sansweet announced the theft and the name of the alleged thief in an open letter to fans on his Rancho Obi-Wan website. He says that it was February of 2017 when he learned of the theft and explains that it happened over the course of one year from 2015 to 2016. Most of the 100 items were "vintage U.S. and foreign carded action figures, many of them rare and important pieces." Sansweet went on to say that "many have been resold or professionally appraised for a total of more than $200,000." To add insult to injury, it turns out that the alleged thief is a friend and long time supporter of the Rancho. Sansweet became aware of the theft after a rare Boba Fett action figure with rocket firing capabilities was tracked from its buyer to the seller, Carl Edward Cunningham. Cunningham was described as "a good and trusted friend" by Sansweet and mentioned that he had hosted him at the Rancho many times over the years. Cunningham surrendered on an arrest warrant and he has been charged with felony grand theft. If convicted, Cunningham could serve up to 16 months in jail as well as pay a fine up to $10,000. Felony grand theft in California is known as a "wobbler," which means that it can pretty easily get knocked down to a misdemeanor, but still carries a hefty fine and up to a year of jail time. Rancho Obi-Wan is located in Sonoma County, California. The place doubles as Sansweet's home and a storehouse for his collection, which he gives tours of with all proceeds going to charity. 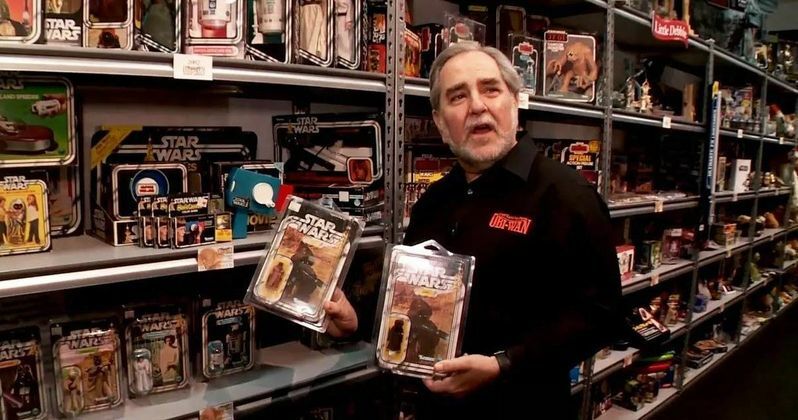 Sansweet was once the head of fan relations at Lucasfilm and he's been collecting Star Wars memorabilia for 40 years. Sansweet says that there are 91,000 individual items on display in the main building with an estimation of 300,000 total pieces, with over half that are stored in a warehouse behind the main building. The facility used to be a chicken ranch and has more than enough space to store Sansweet's ever-growing collection.